I should probably be ashamed to share this and I am kinda sorta. I’m a fan of Basketball Wives. Yes I know the only person who is a wife is Motor mouth Meeka. Yes I’m aware that the show is adding to the arsenal of shows that portray Black women in negative light. Yes, I’m aware that Shaunie throws rocks and hides her hands collects the cash. Yep, saw the episode where Evelyn played the my daddy wasn’t around so I have issues card. Isn’t she an adult? My advice is to get a therapist and let it go hun. Now Tami….Tellitlikeit I-S Tami, I am on her team. True she sips and dips in folks business and will mop the floor with em after she’s deep in her warm fuzzy place after a few cocktails then sets it off but she’s the girl everyone wants as a homegirl. Now Royce. She’s growing on me. I was anti Royce but now I know Royce needs me cheering her on. She needs me to learn to help her learn to be solo but not alone. She needs me to whisper in her ear (my tv has special features) to listen to her girls when they see things in her book that she swears isn’t there. Susie well she’s a misfit in need of a makeover. Yep nothing good about this show except they all have a love for my favorite things: maxi dress and oversize earrings. And yet I tune in weekly for drama filled tv while tweeting. So there you have it. My confession of a realiy tv show that I just can’t live without. Let’s see how many Saints call me on this one. Cheers! 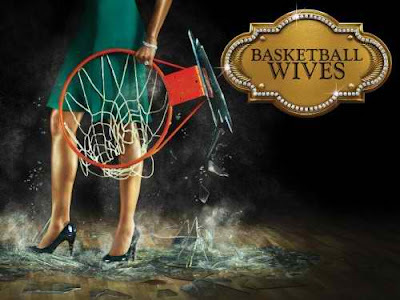 Are you a fan of Basketball Wives Season 3? Lol. I watch the show. I've been watching since day 1. I tend to watch reality TV shows like this. It does nothing to my character just pure entertainment for me. Ok I'm convinced we are sisters. WE have way to many things in common! Whenever,I have time...I find myself watching it! The have me in stitches! haha I've actually seen that show and love it! stupid reality shows are my weakness! and I love basketball, so i like that show too. Those kind of shows are like watching a car crash. You just can't look away! ps. I'm growing my hair out, so yes, it's getting longer. : ) Not to long, but just enough to put it in a tiny pony. I watch the show b/c after a long week, let's face it, we need some trashy TV to look forward to. I've only tuned in for some of last season and this season so I don't know all of the back stories (I mean, drama), but I know enough. The whole situation with Evelyn and the "my daddy wasn't around" thing, girl... you and I are like right >here< on that one: put ya big girl pants on, get a therapist, and get over it. SERIOUSLY!. My parents weren't around either, but I can't let that hold me back. Okay... end rant. The show is pretty funny though. And I love their outfits.